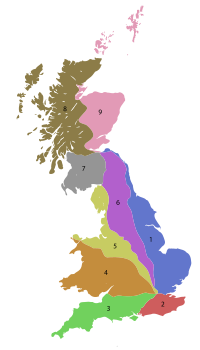 List of A roads in zone 6 in Great Britain starting east of the A6 and A7 roads and west of the A1 (road beginning with 6). A6 road Luton Carlisle Originally London to Carlisle, starting from the A1 at Barnet. A61 road Derby Thirsk Runs through Leeds as the eastern flank of Leeds Inner Ring Road. Forms the primary route between Leeds and Harrogate but is superseded to the south by the M1 motorway to Wakefield. A64 road Leeds Scarborough Main road from West Yorkshire to the East Coast. Is briefly A64(M) as part of Leeds Inner Ring Road. A65 road Leeds Kendal Trans Pennine route. A600 road Hitchin Bedford Runs through Shortstown and Cotton End. Originally started in Welwyn, but the section south of Hitchin is now B656, Codicote Road, High Street, and London Road. A601 road Derby Inner Ring Road. See also the A601(M) motorway in Lancashire. A603 road Bedford Cambridge Section from Sandy to New Wimpole (on the A1198) downgraded to B1042. A604 Unused Used to run from Barton Seagrave to Harwich. Now superseded by the A14, A1307, A143, A1017, A1124, A133, B1352, and A120. The original route went from Barton Seagrave to Huntingdon. Historically, the Godmanchester to Colchester section was the original A132, and the Colchester to Harwich section was the original A135. A613 Unused Ran from Nuthall to Alfreton (downgraded to B600). Later was a temporary route from Birtley to Blaydon. Became part of the A69 and later the A1. A622 Unused Ran from Bakewell to Hathersage (now B6001, A625). Later a temporary route on the Haslingden Bypass in east Lancashire (now A56). A628 road Hollingworth Pontefract Trans Pennine route. A629 road Rotherham Skipton Runs between Chapeltown and the junction with A61 west of Burncross as B6546. A635 road Manchester Doncaster Trans Pennine route. A640 road Rochdale Huddersfield Trans Pennine route. A641 road Huddersfield Bradford Main road between Huddersfield and Bradford. A645 road Crofton Snaith Joins the A638 Road at Crofton and this continues to Wakefield. A647 road Leeds Halifax Britain's first High Occupancy Vehicle Lane (HOV lane). A648 Unused Ran from Kegworth to West Bridgford (former B679; now A453 and B679). An earlier route ran from Denholme to Brighouse (now A644). A668 Unused Ran from Whitefield to Ainsworth (now B6473, A665, and B6292). A6009 road Mansfield Mansfield Mansfield Inner Circle; an earlier one ran from Budby to Worksop (now B6034). A6012 road Unused Was once a road in Bamford from A625 (now A6187) via Mytham Bridge to A6013. Charlestown, Glossop Linking the A57 with the A624. Glossop Town Road. A6019 road Nottingham Nottingham A short stretch of road in Nottingham city centre; an older routing went from A57 High Street to A616 Bank Street in Sheffield, but was later extended north to A61 when it was rerouted along West Bar. A6030 road A563/A47 at Evington A6 at Stoneygate Relic of former Leicester ring road, now mostly substituted by A563 Outer Ring. A6044 road Pendlebury Heaton Park Takes on the names of Sheepfoot Lane, Scholes Lane, Hilton Lane, Rainsough Brow and finally Agecroft Road, respectively. A6062 road A674 in Feniscowles, Blackburn A666 in Ewood, Blackburn The A6062 passes through Livesey and is called Livesey Branch Road for its entire length. The road was originally a turnpike road built in 1810 as a branch of the Blackburn & Bolton Trust. A6064 Unused Ran from Rishton to Harwood Bar (now B6535). A6065 Unused Ran as a loop off of the A1 along the former A1 via through Newark-upon-Trent (now B6325, A616, B6326). Before that, along Blackburn Road in Accrington from Abbey Street (then A680) to Broadway (then A679). A6077 road Blackburn M65 at Guide Previously numbered A6177 until 2005, to remove duplication as another A6177 (the current one) exists. Was originally B6232. An earlier one went from A693 in Stanley to A692 in Hobson (now B6173). A6078 road Blackburn Blackburn Blackburn Town Centre Orbital Route; an older routing ran from A686 in Crook Hill to A69 in Haydon Bridge (now Shaftoe Street; bridge demolished). A6081 Unused Ran from Gateshead to Blaydon (Now Ellison Road, Market Lane, and B6317/Hexham Road; also went east along A1114 and Derwentwater Road before the A184 was built). A6082 Unused Ran in Gateshead from the A184 to the A695 (now A189; originally went south along First Street and Elysium Street to the A692 before the A184 was built). A6083 Unused Ran in Gateshead from the A6081 to the A6082 (became part of the A184 when it was built). A6084 Unused Ran along Mulgrave Terrace from A6125/West Street to A692/Bensham Road in Gateshead. This became part of the A184 as parts were closed off; reused on the old route of the A184 along Askew Road, East Gate, Hawks Road, and Saltmeadow Road. A6103 road Reserved Reserved for Derby; original route went from A62 in Newton Heath to Lightbowne Road in Manchester. A6106 road Dalkeith Portobello The section between the A720 and Dalkeith was previously part of the A68 before that road was diverted further east. A6110 road Beeston, Leeds Bramley, Leeds Part of the Leeds Outer Ring Road. A6111 Unused Ran from Wooler to Scremerston (now B6525). A6115 Unused Ran as a road in Newcastle-upon-Tyne from A191 to A1 (now A194) (former A69 and A184; the A1 went southeast via current A19 and A194 at the time). When the western bypass was built and the A1 was rerouted over it, it became part of the A186 and A184. The original A6115 was in Welwyn from the A600 (High Street; this section of the A600 has since been removed) in Welwyn town centre to the A1 at the Clock Hotel (now Church Street and Roman Street). A6120 road A647 M1 Junction 46 Part of the Leeds Outer Ring Road. A6134 road Unused Was part of the Sheffield Inner Ring Road; became part of the A61 in the 1990s. A6140 road Ashton-under-Lyne Guide Bridge Most of its route is the Ashton-under-Lyne Northern By-Pass; an older one went along former A58 in Bolton from A58 to A58 (now A676). A6141 road Unused Ran from Letchworth to Baldock (now A505 and B197). A6172 road Great Moor Street from A575 to Black Horse Street in Bolton (formerly part of the A579). The original A6172 went along Roff Avenue, Park Avenue, and Polehill Avenue in Bedford (it is unknown whether this was signed). A6514 road Arnold Wollaton Part of the Nottingham Ring Road, linking the A52 west of the city to the A60 north of the city. ^ "A613 (Gateshead)". sabre-roads.org.uk. Retrieved 5 October 2017. This page was last edited on 2 January 2019, at 16:56 (UTC).